Neo4j is a really cool, fast and powerful graph database. It allows you to write awesome Cypher queries to quickly reveal relationships and links between parts of your system that were previously just connected in an abstract, classical relational kind of way. Even more to recommend, it’s free, and it has a quite slick front-end for navigating through your database. The front-end has a well presented, force-graph layout and functionality for saving favourite scripts. Anyways – let’s see some code. Neo4j stores your favourite scripts / folders in your browser’s localStorage , specifically in neo4j.documents and neo4j.folders as nice legible strings of JSON objects. The folders appear to have identifying GUIDs, upon which documents (scripts) are tied to them. The scripts also have names, which either haven’t been implemented in the front-end or I’m just missing (which is entirely possible). In any case, let’s have a look at the export side of things first. This little script will download either a raw dump of the folders and scripts, ready for re-importing directly into another Neo4j front-end, or as a slightly more formatted output showing the name of the script followed by its contents. Opening up, say, a Chrome developer window (try F12) and pasting this into the console will produce an object called cypher . This object has two functions available on it, rawExport() and formattedExport() . formattedExport produces a more readable set of queries. If this is too manual for you, see the Extension. 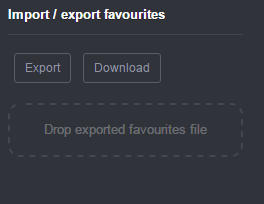 The extension adds buttons for exporting raw and formatted data, as well as a drag and drop zone for importing your favourites queries. It expands on the above by not simply replacing the scripts, but by examining IDs to work out which scripts should be updated, which scripts appended, and which ones should be left alone. Odd – I’ll have a look. Do you have any more details? Can you send me whatever is on the console? Was this on export or import?